We just acquired a 98 Gl/Sidecar rig. It's going to need tires and soon. What is the current choice for the rear? A search here brought up a recommendation for the Austone Taxi tire. I have the Austone also. It's about an inch taller than a stock tire. For those of us who do a lot of cross country riding it's like having overdrive. The engine turns only about 3,000 rpm at 75 mph. As great as that is for us, it may feel like the gearing is too tall with your sidecar. You may be more interested in a 195/55R16 which I can't speak for because I've never run that size. The Austone is 175/80R16. A tire very similar to that in size is 185/75R16. The 195/55R16 also comes in the run on flat with very stiff sidewalls. Folks will be along any minute now to give you some insight based on experience on these tires. What ever your choice of tire, you are going to love your bike, the ride and the adventures it takes you on. I do not believe you will get the 195/55R16 to fit in the swingarm or to fit the narrow wheel. When I was riding a 1500 I did use a Dunlop ROF DSST WinterSport 175/60 R16. This is a run flat tire. For a while it was not available but it seems I recently did see it advertised. You might try TireRack or look at Canadian suppliers which might still have winter tires in stock. This tire is just a tad shorter than the stock bike tire, which may work well with the added load of the hack. That's what I was thinking. Perfect size for an 1800 but too wide for a 1500. I have a 195/55/16 on a 1500 rim/ final drive on a 1200 swingarm in a 1000 frame, however the frame has been bobbed. It would probably have issues hitting somewhere in stock form. Thanks for the replies. I'm going to be feeling my way on this one. The ability to drop the RPM with a different size tire sounds attractive. I'm sure that it's gonna be a gas hog with this two seater hack on it. 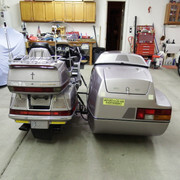 There is also a forum here specifically for Trikes, Trailers and Sidecars. It may be a sub forum of the Technical Forum. I'm sure you will find more people who share the same issues and concerns as you on that one. Thanks. I searched there before posting here. Seems to be mostly Trikes and not much usage. I agree - I tried putting a 195 on my '94 but decided to do some measuring before I went to the trouble of mounting the tire. The swingarm has about 185 mm of clearance so a 195 mm tire is going to be a tight fit! I ended up with the Austone and it fits great. I've heard that they are no longer being shipped to the US, and the only distributor has about 10 left so if you want one you better order it quickly!